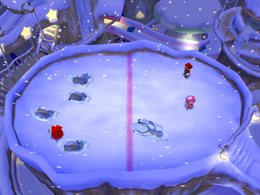 Snow Brawl is a 1-vs.-3 minigame in Mario Party 6. Its name is a pun on "snowball" and "brawl". There is a page in the Miracle Book that shows this minigame. It is called "Yoshi's Revenge". The three players attempt to throw snowballs at the player, but miss. The player then runs into the back corner of his side, followed by four Shy Guys/Ukikis jumping into the arena. The object of the game is to knock down all of the players on the other side of the snowball fight. The lone player is given four computer-controlled teammates (Ukikis during daytime and Shy Guys at night). In order to win, the single player must be the first to hit his or her opponents, and the three opposing players must hit the lone player (the four CPUs do not need to be knocked down to win). 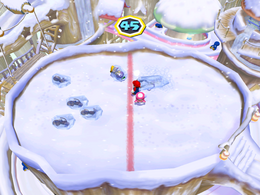 The player must first create a snowball by pressing before he or she can throw it. Snowballs thrown that hit each other are destroyed upon contact. Any players hit by a snowball are frozen solid. The winner(s) do their victory animations on their side of the arena, including the remaining Shy Guys & Ukikis if the solo player wins. Rules – "One player, joined by three monkeys or Shy Guys, faces off against the other three players in a snowball fight for the ages!" 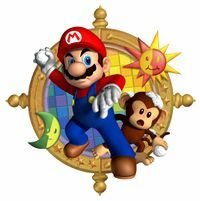 Advice – "The solo player can use their monkey and Shy Guy teammates as defensive barriers!" This page was last edited on February 23, 2018, at 00:49.